I discovered the delights of dukkah not so long ago at a great little pop-up restaurant in Frome called The High Pavement Evening Cafe, which I was rather excited to see will re-open later this year. Also written duqqa or dukka, this spicy Egyptian side dish consists of nuts, seeds, herbs and spices, toasted and then crushed up together to create something so simple and yet so incredibly delicious. I’m amazed I haven’t come across it before. It was served to us at the start of our meal at The High Pavement as an accompaniment to bread alongside oil and vinegar. I was instantly hooked. When I tried making it myself at the weekend, I served it the same way. 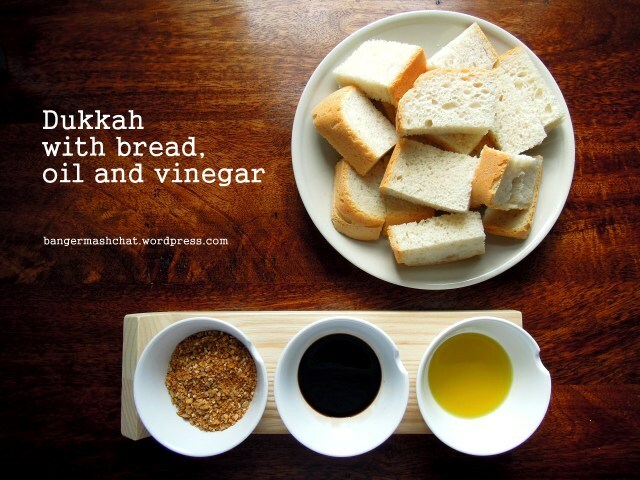 Homemade bread dipped in oil, then vinegar and then dukkah is just so, so good. Admittedly I made it a little too spicy for the children and they weren’t impressed at all. Next time I’ll go a little easier on the paprika and perhaps they’ll get into it too. It is perfect finger food after all. But my husband and I got well and truly stuck in. 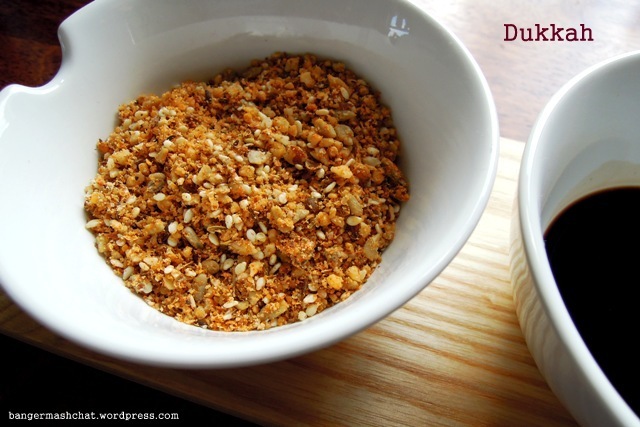 I found a hundred and one different ways to make dukkah on the internet; it seems to be the kind of dish you can play around with – lots. According to Wikipedia it’s typically made with hazelnuts but I didn’t happen to have any of those, so I went with almonds and walnuts. But you could use pistachio or just about any other type of nut you fancy really. Similarly there are a hundred and one different ways to use dukkah. Sprinkle it onto salads and soups, over hummus and soured cream, use it as a crust for fish or a rub for meat, or as a topping for flat breads. I took some to work in my packed lunch the other day, bringing to life an otherwise boring cheese roll. It is very versatile. Dry fry the almonds, walnuts and sunflower seeds in a hot frying pan until they just begin to turn a darker, golden colour. Remove from the heat and allow to cool. In the same pan, toast the fennel seeds for half a minute, then add the cumin seeds and toast for a further 30 seconds. Pour these into a bowl, separate from the nuts and sunflower seeds. Next add the mustard and coriander seeds to the pan and toast for a minute or so, before tipping into another bowl. Reduce the heat a little and toast the sesame and caraway seeds until the sesame starts to change colour. Place in yet another bowl. 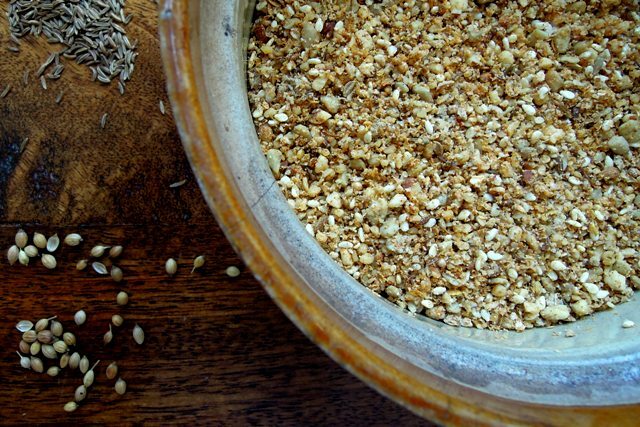 Crush the fennel and cumin seeds in a pestle and mortar, before placing in an electric grinder along with the almonds, walnuts and sunflower seeds. Give them a quick whizz until you achieve a rough crumb texture and then pour into a bowl. Lightly crush the mustard and coriander seeds in the pestle and mortar and add these to the dukkah bowl, followed by the sesame and caraway. Season with the salt and paprika (go easy if you have kids) and mix well. There it is – you’re done. So, how will you eat yours? I served mine in my gorgeous Brabantia dip servers, part of the fantastic prize I won last year at the MAD Blog Awards. This sounds lovely… My kind of food! 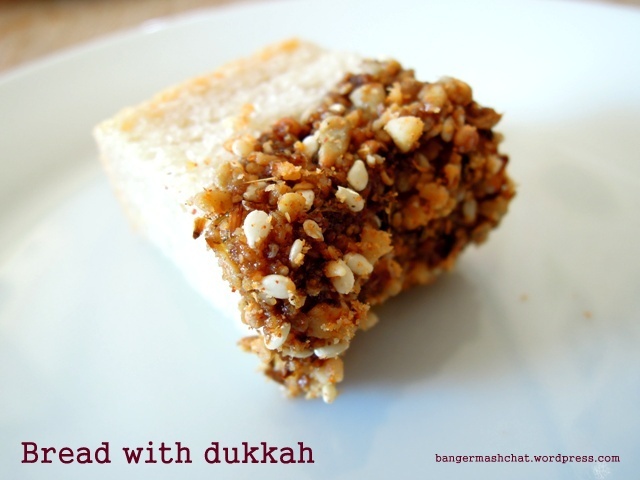 I’ve never even tried a dukkah, let alone made one….but I’m so going to now. What a heavenly mix of flavours and textures….and wonderful photos! I’m so glad I wasn’t the only one who hadn’t come across it. I assumed there had been some dukkah party going on all these years but no one had thought to invite me! You really should try it – I bet it’d be right up your street Lou. I got given some dukkah by my Secret Santa this Xmas but I have never made my own. Now I have the recipe, I have no excuse. Looks gorgeous! Thank you! And it’s so easy too – despite the instructions looking a little long-winded! I love dukkah, made it to a Hugh Fearnley Whittingstall recipe so far. Yours looks great and I like the idea of using it as a crust for fish, hadn’t thought of that. I’ll have to check out HFW’s recipe – what nuts does he use? Ooh yes, I think I’ll be trying that one next! Pingback: Food I Have Been Daydreaming About Recently – Troubadette!